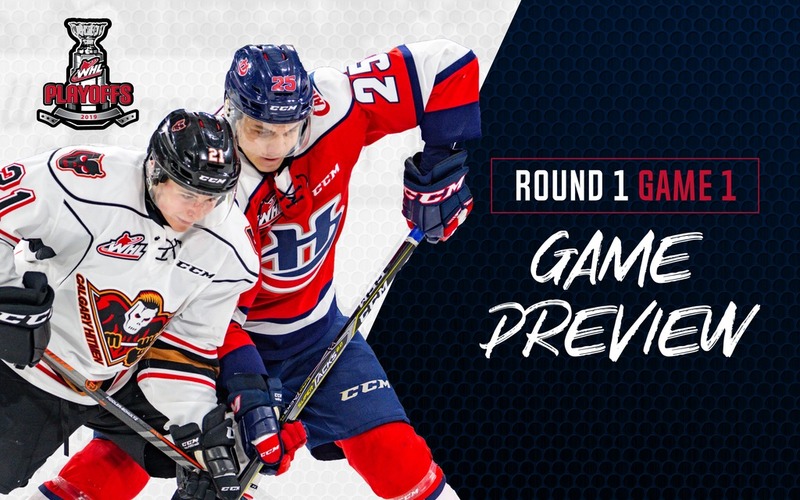 Lethbridge, AB – The Lethbridge Hurricanes begin the 2019 WHL Playoffs presented by Charlton and Hill at the ENMAX Centre tonight as they welcome the Calgary Hitmen in Game 1 of their first-round best-of-seven series. The Hurricanes finished the regular season with a 40-18-5-5 record as they finished second in the Central Division standings. The ‘Canes enter the playoffs on a season-long eight-game winning streak while having collected victories in 11 of their last 12 games. The Hitmen ended the regular season in third place in the Central Division with a 36-26-5-1 record. Calgary enters the playoffs having lost their final four games of the regular season, which included a 7-4 defeat in Lethbridge to the Hurricanes on March 9th. The two teams met six times in the regular season with the Hurricanes posting a 5-1-0-0 record while winning each of the last five meetings. The ‘Canes outscored the Hitmen 35-24 in the season series as they averaged 5.83 goals per game. There will be a United Way Tailgate Party on the ENMAX Centre plaza prior to the game as it will begin at 5:00pm and will go until 7:00pm. Browns Socialhouse will be providing burgers, chips and water by donation while Ian Sharek from 106.7 ROCK will be broadcasting live. Tonight’s game will be the first of two in the series at the ENMAX Centre as Game 5 and Game 7, if necessary, will be played at Nicholas Sheran Arena. Tickets for tonight’s game can be purchased online at www.enmaxcentre.ca, by calling 403-329-SEAT (7328) or by visiting the ENMAX Centre or Yates Ticket Centre’s. PLAYOFF SERIES: Tonight will be Game 1 of the best-of-seven first round series between the Hurricanes and the Hitmen. It will be the first time the two teams will face-off in the WHL Playoffs since 2009 while it will be the fifth time overall the ‘Canes will face the Hitmen in the post-season. REGULAR SEASON SERIES: The Hurricanes and Hitmen met six times in the regular season with the ‘Canes posting a 5-1-0-0 record after winning the final five head-to-head match-ups. The ‘Canes outscored the Hitmen 35-24 (5.83 – 4.00 avg.). Jordy Bellerive led all ‘Canes scorers having recorded 13 points (7g-6a) in six games while Mark Kastelic led the Hitmen in scoring with 9 points (5g-4a) in six appearances. Four Before: The Hurricanes have met the Calgary Hitmen four prior times in the WHL Playoffs. The ‘Canes have posted a 1-3 playoff series record against the Hitmen, having been swept in four games in the first round of the 2009 playoffs the last time they met in the post-season. Lethbridge’s lone series win as in the 2008 WHL Eastern Conference Championship Series eliminating Calgary in a four game sweep. Game 1’s: Lethbridge has posted an all-time record of 19-17 in Game 1’s in their WHL post-season history. The ‘Canes won two of the three Game 1’s in the WHL Playoffs last year with wins over the Red Deer Rebels and the Brandon Wheat Kings before falling to the Swift Current Broncos. All-Time Record: In the playoffs, the Hurricanes have posted an all-time 83-100 record in 183 games. The ‘Canes have posted an all-time 18-18 series record while having gone 4-2 in playoff series in the last two WHL post-seasons as the ‘Canes have gone to the third round in back-to-back seasons. Back-to-Back: The Hurricanes have gone to back-to-back Eastern Conference Championship Series. In 2017, the ‘Canes defeated Red Deer and Medicine Hat before falling in six games to the Regina Pats. While in 2018, the Hurricanes bounced Red Deer and Brandon before falling in six games to Swift Current. 70-30: During the regular season, the Hurricanes had five players reach the 70-point plateau: Henry (94), Cozens (84), Bellerive (83), Leschyshyn (81) and Elmer (81). They also had five players crack the 30-goal mark: Leschyshyn (40), Elmer (39), Ross (34), Cozens (34) and Bellerive (33). The last time the Hurricanes had five players reach both the 70-point and 30-goal mark was in 1996-1997; the ‘Canes went on to win their only WHL title while finishing as runner-ups at the 1997 Memorial Cup. Pen to Paper: The Hurricanes have had two players sign NHL Entry-Level Contracts in the month of March. On March 16th, Jake Elmer signed a three-year deal with the New York Rangers while on March 1st, forward Nick Henry inked a three-year contract with the Colorado Avalanche. In total, the ‘Canes have four players who have signed NHL contracts as Jake Leschyshyn (VGK) and Jordy Bellerive (PIT) have also signed. This is 40: Lethbridge finished the 2018-2019 regular season with a 40-18-5-5 record. It was just the seventh time in franchise history the Hurricanes have reached the 40-win plateau while it was the third time in four years under head coach Brent Kisio. No other ‘Canes coach have guided a team to 40+ wins in three separate seasons.